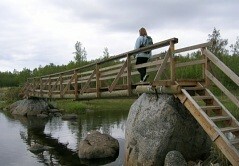 The Björköby-Panike hiking trail is 12 km long and leads hikers through many different types of nature. The hiking trail is partly on Björkö and partly on smaller islands. Transportation between the islands is by boat. The trail starts either at Panike or at Svedjehamn in Björköby. The trail is marked by red crosses and information boards have been placed at various places of interest. There are two sites for grilling along the trail. Packed lunches and guiding: Café Salteriet tel +358 6 352 4016. Björkö Village Association has restored the hiking trail known as Bodvattnet runt, which is three km long. Start from Svedjehamn. Sommarö nature trail can be found in the old fortress area. The trail starts at the guardhouse carpark and is 2 km long.